Natural flagstone pavers provide even more advantages to homeowners who want to add hardscaping to their yards. With many choices, designs and benefits of this type of stone, it is no wonder it is gaining ground in the residential area. Choosing the right flagstone for your yard can be exciting and rewarding once the project is completed. Since they are not a very porous material, these pavers will not have any adverse effects due to extreme Minnesota weather conditions, whether hot or cold. They are also known as being low absorption, so even in the wetter months, flagstone will not deteriorate or break down. They are harder to crack because they do not retain moisture and can stand strong against heavy items hitting them or a large amount of traffic going over them. This makes them perfect for areas that get high use. Installation of the pavers is also easy to do, and through the help of the right landscape installation professional, you can have walkways or other paver features easily, affordably and quickly. Choosing the right flagstone look and feel for your yard and designing the perfect layout is the hardest part about the job. But that’s where a creative landscape designer comes in. Flagstone comes in many different sizes and colors, making it ideal for those that wish to be creative or anyone that wants to add a little flavor into their yard by using them as accent pieces or to edge a garden bed. Flagstone is also a beautiful option for other areas around the exterior of your home such as a patio or outdoor sitting area in the garden, giving you even more design options. There is a right kind of natural flagstone paver for any kind of home looking to add to their yard. This makes them aesthetically pleasing to any landscape scheme. When you’re ready to get started, speak with us here at Architectural Landscape Design. We can help you design and install a beautiful flagstone paver area, walkway or even a garden outline to provide you with the beautiful appeal you’ve always wanted in your yard. We’re experts in working with natural stone. 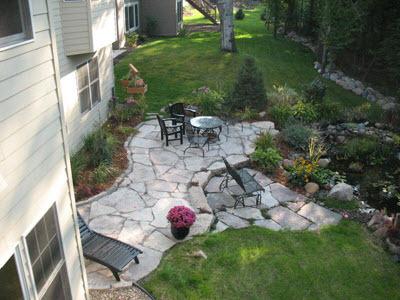 ALD is a Minnesota licensed landscape design, installation, and maintenance company serving the Minneapolis area and surrounding communities, including western Wisconsin.